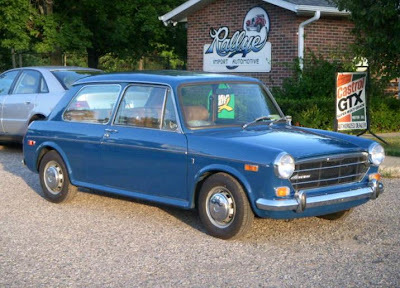 Just A Car Geek: 1971 Austin America - 149 Original Miles!! 1971 Austin America - 149 Original Miles!! Except for maybe a few Austin America club sites, I doubt you'll find any website / blog that has as much written about the Austin America as this one does. What can I say? I really like these cars. This one is extraordinary. This has just 149 miles on it. 149 miles. One-hundred-forty-nine miles. It has never been titled. The seller does not explain the reason for this car having never been titled or, for all intents and purposes, driven, but it is not a car that was just tucked away and forgotten about. According to the seller, "Even though this car is stored, it does not mean that it was not maintained. 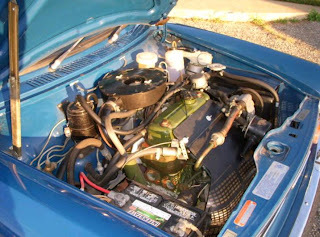 The fuel is drained every two years, and the car is run, but not driven every 6 months. Over the years service has been performed. The tires, battery, rear wheel cylinders, clutch slave cylinder, lower radiator hose, water pump, fuel filter, carburetor rebuild, several oil changes have been included in the service. Any service has been performed by professional foreign car mechanics with original equipment parts". Amazing. Also included with the car is a never installed complete OEM dealer factory air conditioner kit. This is just an incredible find. I have zero indoor storage space available to me right now. If I did, I'd be all over this car. Located in Midland, MI, click here to see the eBay listing. I received a bunch of e-mails about this car. I guess my obsession with the Austin America is becoming too obviuos. BIG thanks to Matt, Jim, Kelly, John, "Racer X", Jason, another Matt, Cindy, Rodney, Ian, and Joe for pointing this car out to me. 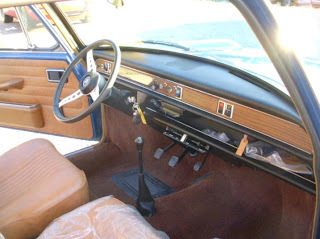 One of my favorite stories about an Austin America is about a guy who bought one sight unseen. You can find his story here. Update - How extraordinary is this car? I just opened an e-mail from JaCG reader, Anthony, who pointed out that this car is also featured today on Bring a Trailer. You know its a pretty extraordinary car when those guys write about it, as they pretty much cover the "top shelf" cars. You can read their take on it here. BaT also wrote about the Conquest you posted earlier this month. You may have more in common with those guys than you think.